No matter what age you are, there’s lots to do at the Great Cortland Pumpkinfest! Talented local performers rock the stage all weekend long. The craft show showcases more than 100 local crafters and artisans. The Kids’ Zone offers games and activities for children of all ages. Delicious festival food can be found, with local favorites honoring the flavors of the season. And other downtown Cortland establishments offer activities that make Pumpkinfest weekend a truly community-wide celebration of the harvest season. Photo credit: Cortland County Convention and Visitors Bureau and Kris Reynolds. Photo credit: Great Cortland Pumpkinfest Social Media Committee. The Kids' Zone Tent has games for children of all ages to play and activities to get them in the spirit of fall. Those who come in and play games can win prizes all weekend long. 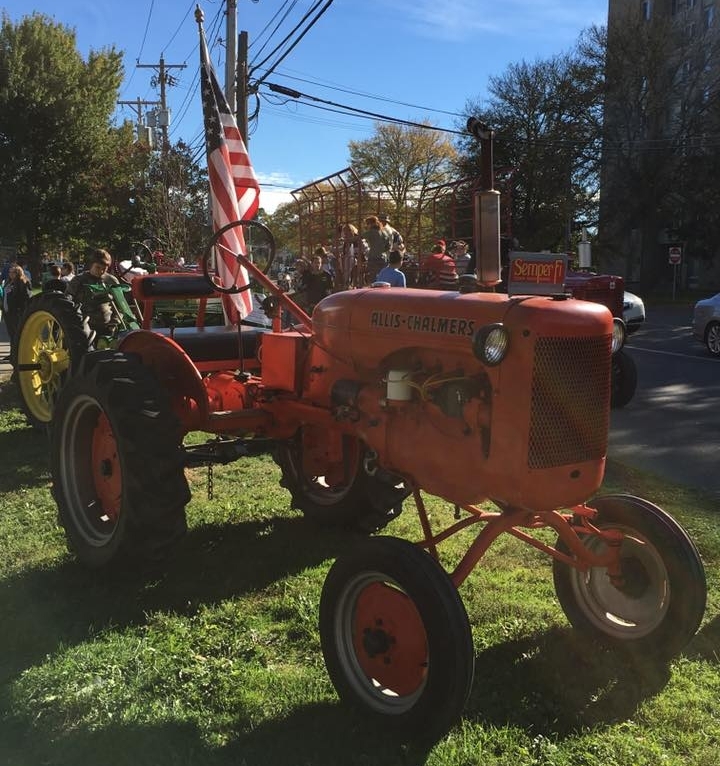 The Tractors of Yesteryear are on display both days, showing many of the tractors that were used on farmland around the area over the course of the past 150 years. Members of the Tractors of Yesteryear club are available to talk about the tractors. Talented local musicians will be performing throughout the weekend. For a complete lineup, visit the Entertainment page. The Great Cortland Pumpkinfest Craft Show features more than 100 local crafters and artisans with their works for sale. Hayrides are available throughout the weekend for $1 a piece (maximum $5 per family)! Children under 5 ride for free! Decorate your pumpkin (real or hand-made) to resemble your favorite character from books, films, TV or music. Learn more about the Pumpkin Decorating Contest and get your application form here. Come enjoy a drink at the Pumpkin Pub from 12pm-5pm both days of the Great Cortland Pumpkinfest. A selection of beers, including Blue Light, Shock Top, Saranac Oktoberfest, Southern Tier Harvest, McKenzies Pumpkin Jack Hard Cider, and red and white wines will be available while you listen to the live music rocking the festival. College football will be shown on Saturday and pro football shown on Sunday. A carnival-style midway will be at the Great Cortland Pumpkinfest courtesy of Ontario Amusements. Rides for all ages will be at the festival all weekend- we hope to see you there! Stroll around Courthouse Park and take in a good story. The Story Book Walk will feature “Those Darn Squirrels” by Adam Rubin, and allow families to take a self-guided tour around the festival while getting into the spirit of autumn. What better way to get kids in the spirit of autumn than with a good book? Join the Cortland Free Library Youth Services Miss Tammy at this year's Pumpkinfest for Fall and squirrel themed story time and activities, including music and finger plays. She will be in the Kids’ Zone tent on Saturday from 11:00 - 11:30am, and again from 12:30 - 1:00pm. Come on over and listen in! Cortland Performing Arts loves being a part of the Great Cortland Pumpkinfest! Come see the TheatreDanz dancers perform hits at this year's festival, and join them afterwards to learn some of their moves! This year’s performance will take place at 12:30pm near the rotunda in the center of Courthouse Park. Cortland Performing Arts has been bringing the love of dance to downtown Cortland for 14 years. They offer classes for all ages and levels in: ballet, tap, jazz, pointe, modern, acro, hip hop, and Irish! TheatreDanz Company is an audition-only program designed for dancers looking for more committed training and performance opportunities. They have performed at dance competitions, conventions, events across the central NY region, and even Disneyworld! Voting for the Cortland Standard’s fall photo contest will take place throughout the weekend. Stop by The Great Cortland Pumpkinfest pumpkin decorating tent and cast your vote for the winning photo! The contest winner will receive a $100 Cortland Downtown Partnership Gift Certificate and have their photo featured in the paper. Rules and regulations are available here. Proceeds benefit Cortland Loaves and Fishes. Held in conjunction with National Fire Prevention Week in October. Our firefighters provide educational opportunities, demonstrations and fun events like the Junior Firefighter Combat Challenge. Activities change each year but the Auxiliary is always there with popcorn and cider for this family-oriented event! This is a free family event! For more information call (607) 756-5612, e-mail david.jensen@cortlandfire.org or visit cortlandfire.org.